I was out of town climbing when I heard the news. 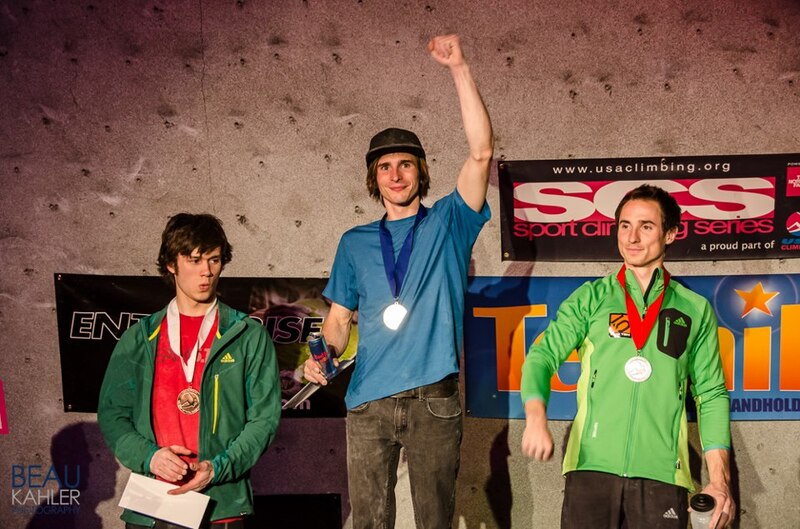 Noah Ridge was on the podium at SCS Nationals alongside two of the worlds best climbers, Daniel Woods and Carlos Traversi. To the typical sports fan, that’s like saying the kid in your town is now playing ball with Kobe Bryant or handing off to Adrian Peterson. 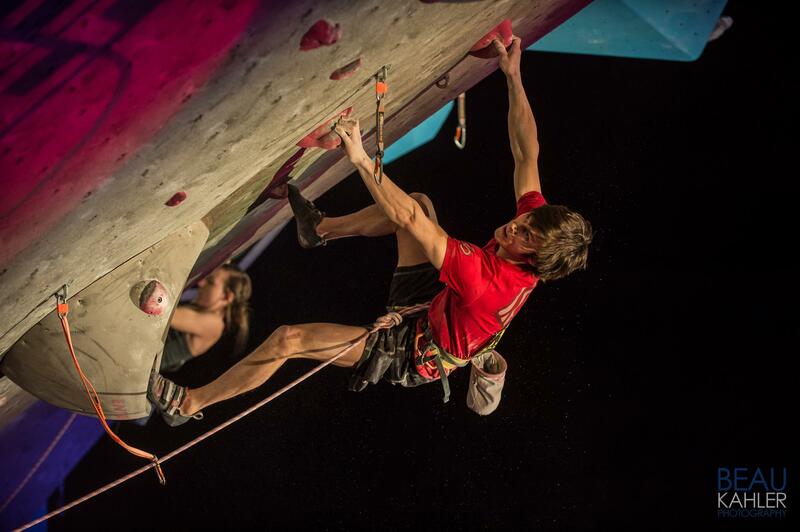 But, climbing isn’t your typical sport, and Noah isn’t your typical kid. 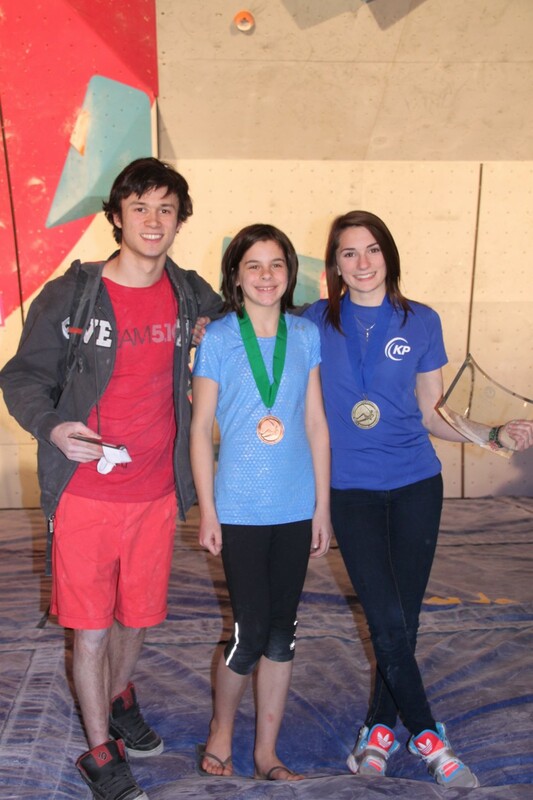 Along with Noah, local climber and youth national champion, Kyra Condie was also in Colorado representing Minnesota climbing at the Sport Climbing Series Open National Championship put on by USA Climbing. This was Kyra’s first year of age eligibility for the Open division of SCS. Noah had been here before, however, taking 4th place last year leaving him one step off the podium. After months and months of training for ABS Nationals and SCS Nationals, Noah turned out an inspired performance to take 3rd place and earn a spot on Team USA. As the youngest female competitor at SCS Open, Kyra showed grace and power taking 6th place in the sport climbing competition and an incredible 1st place finish in speed climbing, also earning a spot on Team USA. Fortunately for me, the independent media company, Louder than 11, has made their live broadcast of the event available for streaming and I was able to watch the comp after returning from my travels. I caught up with Noah and Kyra by email to find out more about their experiences. Congratulations to you both! How was your SCS comp experience? Describe the event and your path to finals. Noah Ridge: The event has 2 rounds, qualifiers and finals. I flashed both of the qualifier routes putting me in a tie for first with 4 other guys. In total the top 8 people get to move on to finals after qualifiers. In finals there is one route and whoever gets the highest on the route wins. Kyra Condie: Finals is really crazy and awesome to be a part of. Just climbing in a spotlight and with that many people watching is pretty unreal. Are you happy with your performance this year? KC: I’m really happy with how I did! I didn’t expect to make USA team in both sport and speed, so I was pretty thrilled. NR: I’m super happy with my performance this year. I was really excited that I stand up to such a strong field of competition. I also reached one of my goals to improve on my placement from last year, 4th. In addition to the work you do here in MN, you have been training at Movement in Colorado where the SCS comp was held. What was your training like? Who did you work with? KC: Well I’ve been going to boulder by myself periodically, about once a month, Noah’s come with me two of the times. Kris Peters is extremely motivating as a trainer and really makes me work hard. We do a lot of endurance laps and a lot of cross training too. I usually train by myself, just with Kris, but when Noah has come, we train together with Kris. What is the most grueling exercise you are put through at Movement? NR: I’m not sure, all of it was pretty grueling. Noah and Kyra with Kris Peters at ABS14. Did you feel an advantage having trained on the walls that you would be competing on? NR: I think doing a lot of climbing on such steep walls helped a lot of with my endurance. KC: It definitely helps to have experience on the walls of a competition. I think I felt a lot more comfortable on the wall this year than I did last year. 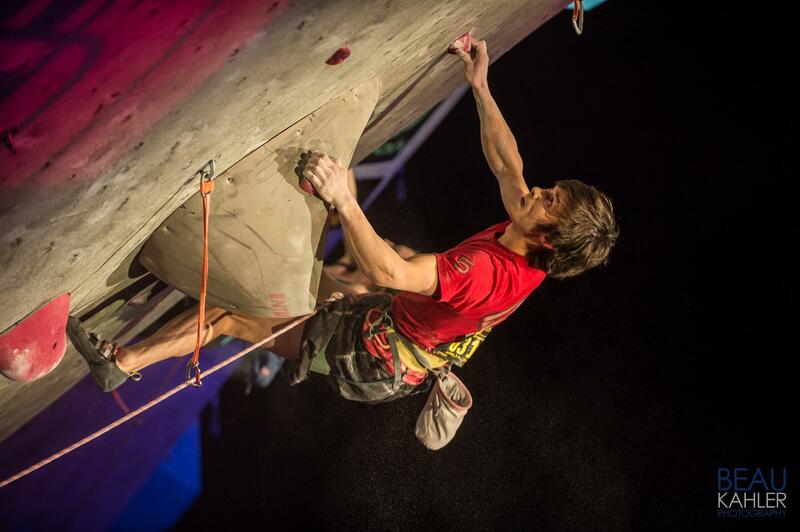 Last month, you were at the ABS Nationals, so you had been focusing on bouldering prior to that. How tough is the switch from training for boulders to sport? Is there a benefit to working bouldering power, then training for endurance? Do you have a favorite between the two disciplines? 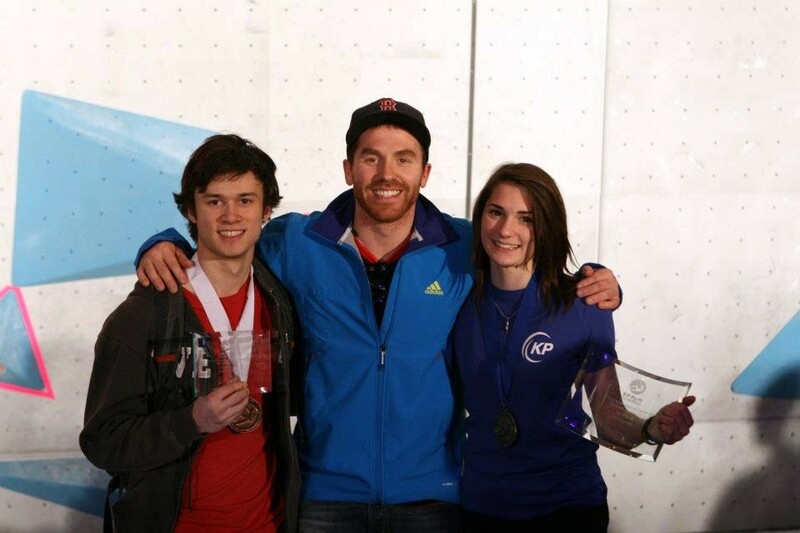 KC: Bouldering is by far my favorite discipline, but I do get psyched on rope climbing during the SCS season! It’s a pretty hard transition to do, mainly because I’m sad not to be bouldering anymore! Also working up endurance can be frustrating (but very satisfying!). I think it’s always good to have a balance of both power and endurance, but endurance is definitely more important for ropes. You lose endurance really quickly, but you keep power, so I’d say it’s easier to switch from bouldering to ropes than it is ropes to bouldering. NR: I retain bouldering power a bit better than endurance so coming into sport season with a lot of power helps a bit. I like sport climbing season a bit more but I like both a lot. These were really tough gym routes. Only one competitor topped either of the finals routes. What grade do you think your route was? KC: The route setters said they were aiming for 5.13+! I’d agree with that. NR: Probably around low end 5.14 for the finals. Do you also sport climb outside? What is the hardest grade/route you’ve sent? KC: I do! But I haven’t a whole lot yet. I have some trips planned for this summer and I’m also hoping to get out to Willow River in Hudson, WI a lot in the next few weeks. I’ve done 13a at Willow. I think I’ll be able to send Dry Lightning (13c) at Willow within my next few tries, I’ve only gotten on it twice. Back to comp climbing, what is coming up next? KC: The Dominion Riverrock in Richmond, VA! 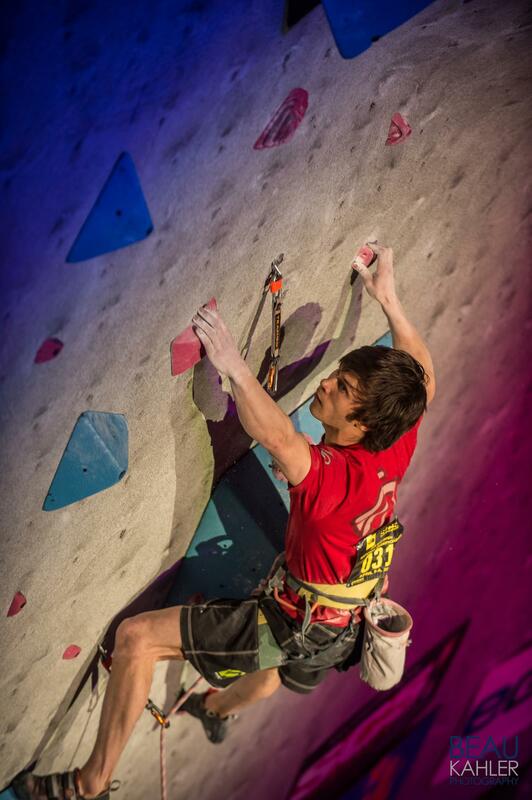 Youth SCS regional is the weekend before that though, but Riverrock is my next big competition. After those two I have the Vail bouldering World Cup, SCS Youth Divisionals, SCS Youth Nationals, and the Youth World Championships in August (which I have a bye to for speed climbing). Your performance earned you a spot on Team USA. Is there a comp that you will represent the US in? KC: The Vail World Cup! But that’s bouldering, not sport or speed climbing. I’m eligible for all of the World Cups, but I’m not planning on doing any sport climbing ones because there isn’t one in the US this year. What sponsorships do you have? What sponsorships do you hope for? 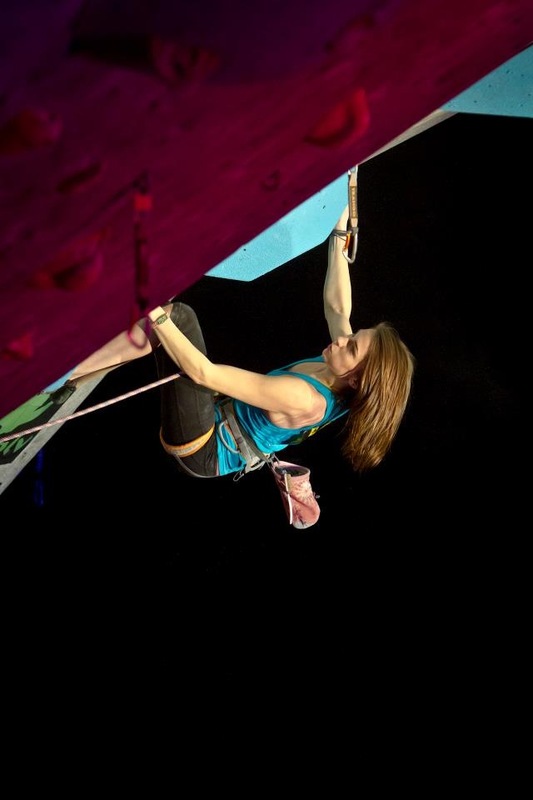 After the ABS Nationals last month, I chatted with you both and also with Abigail York, an up and coming young climber from your former team, VE Mountain Goats. When asked who her idols were in this sport, she said it was you two. Are you aware of being a role model to younger climbers? NR: Yeah I’m definitely aware that I’m a role model to younger climbers I try to make sure that I do my best to be a good role model. KC: No I didn’t know! But it’s a pretty amazing feeling to be a role model; I remember looking up to Alex Johnson when I was a little older than Abigail. Noah Ridge, Abigail York, and Kyra Condie. What advice would you share with young climbers that want to achieve the kind of successes that you have reached so far? KC: You really just have to enjoy climbing, make it into something that you want to do, not have to do. I know so many people who complain about having to go to their sport’s practice, while I look forward to climbing all day. Once you have that initial drive to climb, you get motivated to train and that’s what makes you better at climbing. NR: Work Really Really Hard! Follow your dreams, don’t do it if you don’t want to. The chat rooms blew up with support for you both during the live feed. Did you have a lot of people there with you at the comp? Do you feel the support of everyone back home rooting for you? KC: My family in Colorado absolutely LOVES to watch the competitions. I had my aunt, uncle, cousins, and even my cousin’s friends watching and cheering. It’s really a great feeling to know I had everyone behind me! NR: Yeah I was really psyched to have everyone back home rooting for me on the live feed. Noah, you turned 18 this year. Are you able to compete in SCS Youth one more time or are you done in the youth circuit now? NR: I will be competing this year for the last time unfortunately after this year I will only be able to compete in Open. After you climbed your final route and during the live feed, you were asked to join the commentator, Climbing Narc, in the broadcast booth. It was pretty fun on this side to hear you interviewed during the comp. Did you enjoy that experience? NR: Yeah the interview was a lot of fun, I really enjoyed talking to the Climbing Narc… the interview was really spontaneous, I just got pulled off to the side and asked if I wanted to do an interview we didn’t discuss anything before it. Kyra, just last month, you were the youngest competitor at ABS Open Nationals. Once again, you were the youngest competitor at SCS. Does that affect you at all? Is there any intimidation being the youngest? KC: It actually feels pretty cool to be the youngest, knowing I have a lot of years to catch up to the other competitors, and yet still being able to hold my own against them. You competed in two disciplines at SCS, both sport and speed climbing. Is that hard to balance competing in two events in the same weekend? Did you do any different training for speed than you were already doing for sport? KC: I actually didn’t train speed at all for this comp… I’m really fast by accident, so speed climbing comes pretty naturally to me. We also don’t have the 10 meter IFSC speed route in Minnesota anywhere, so I can’t train it. But it’s not really a challenge to balance both, its fun! 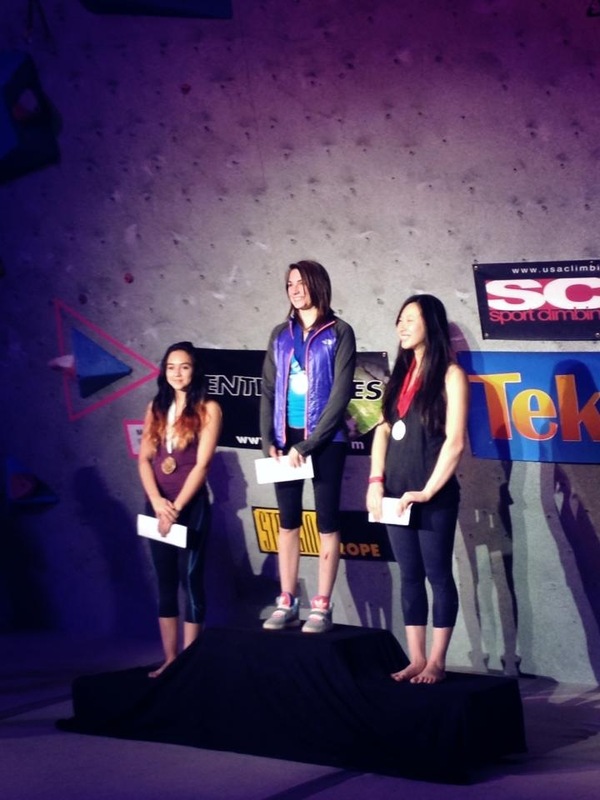 You finished 1st in the nation in speed climbing.You finished 1st at ABS Youth Nationals. You are a champion, literally. How does that feel to you? 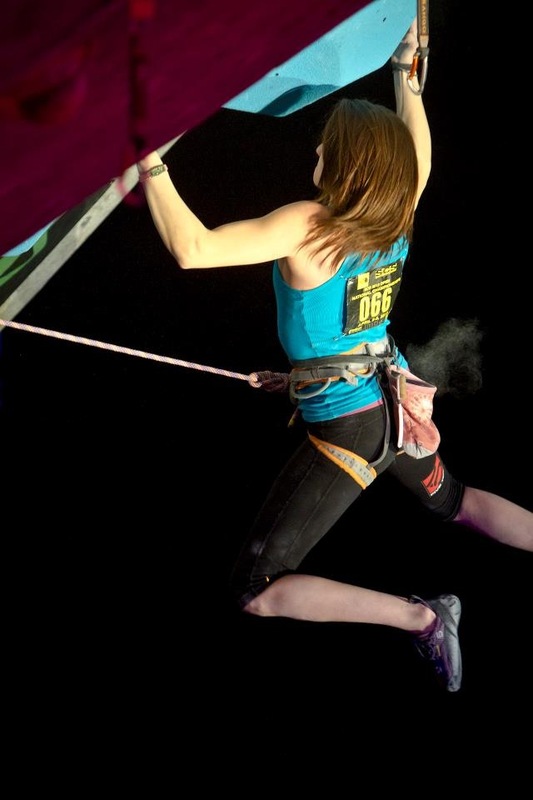 Did you imagine yourself being a champion level climber when you were getting into this sport? KC: Well, I always had a dream to be national champion one day, but I had no idea that it was actually going to happen. It’s pretty surreal, and really takes a while to sink in. I’m just hoping to keep training hard and hopefully having that help me keep moving forward. SCS Youth is kicking off very soon. Last year, you took 2nd place in this competition. Having done so well in open this year, do you have a higher expectation for yourself competing in youth? KC: I’m really going to train hard for youth this year, I’m not going to put expectations on myself, but I’m definitely hoping to do even better than last year. I need to get more psyched to climb ropes and then I’ll be set. I’m doing a training camp in Atlanta for the two weeks before youth nationals, its held at stone summit and is extremely helpful, because there’s really no way to get good at climbing at stone summit without climbing there. At only age 16, you have a couple of more years in the youth circuit while still being eligible for open comps. Will you continue juggling both until you age out of youth? KC: Definitely! 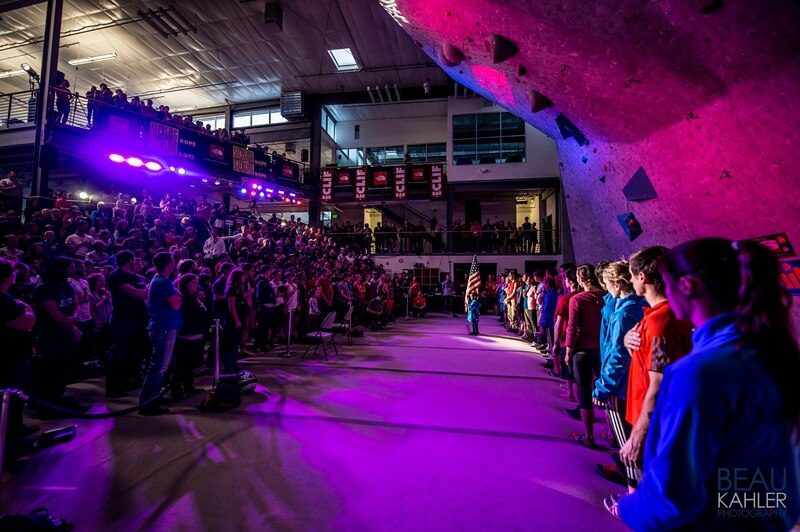 I love competing, meeting new people and seeing everyone who’s just as in love with climbing as I am is the best part! At only 16, you took 9th in your first ABS Open National and 6th at SCS Open. Are you starting to see yourself taking the podium soon? 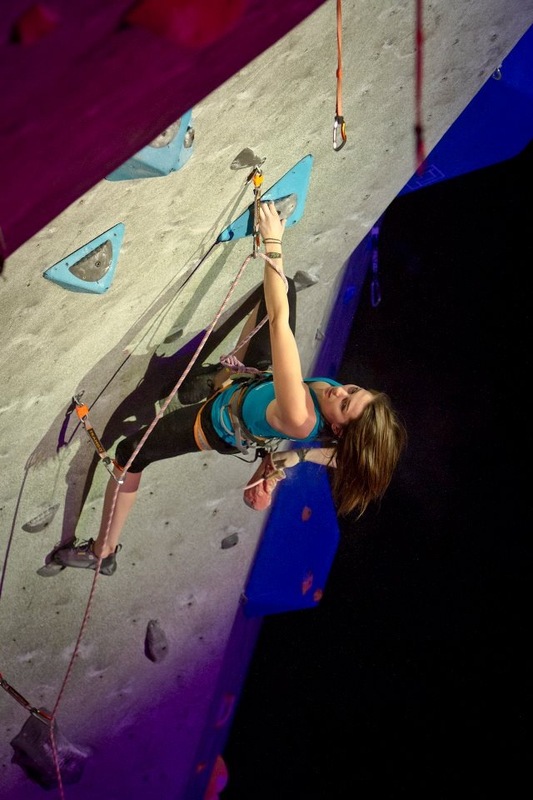 Are you seeing yourself as a part of the next generation of top tier women climbers? KC: I’m hoping so! I’m going to continue training even harder and hopefully be to that point soon! I think I’m on the right track right now, but I’m going to keep doing what I’ve been doing and training harder/more and hoping it gets me there! After ABS Open, I suggested that you were next year’s dark horse competitor. After SCS, I’m thinking people are going to remember you next year and keep you on their radar. How are you feeling about your achievements so far this year? KC: I feel great about everything! Its crazy to look back on how far I’ve come, especially because I had my back surgery (10 vertebrae fused!) three years ago. Correction: Noah was originally mentioned as being a “high school kid”, when in fact, he is in college at the U of MN now. He remains a kid in my eyes. As such, the text above was edited.